1. 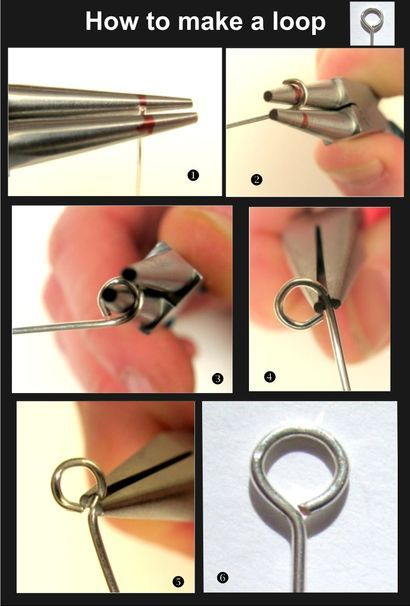 To make a P-loop, hold the wire at the very end on the mark of your round nose pliers. The wire should sit flush on the jaws, run your finger over the jaws to make sure it is not sticking out. 2. Twist the pliers away from you so that the end of the wire is twisted around the jaw. 3. When you cannot twist your wrist any further, release your grip, swivel back the pliers towards you, grip the wire tightly and twist again towards the longer wire until the end of the wire meets the straight length of wire. 4. To center the loop, insert the tip of chain nose pliers into the loop at the point where the wire end meets the length of wire, and bend back slightly (5) so that the loop sits right in the middle of the wire.